"Pre-service ESL teachers’ instructional discourse during one-on-one tutoring" by Andrea Honigsfeld, Ed.D. ELTED Journal does not impose any copyright on articles published, which may appear subsequently elsewhere in revised form. We do, though, request acknowledgment of first place of publication. Teacher discourse or teacher talk is the form of discourse that teachers use when instructing their students. Chaudron (1983) described teacher talk as a particular form of speech used by teachers to instruct their students through language that is clear and explicit. 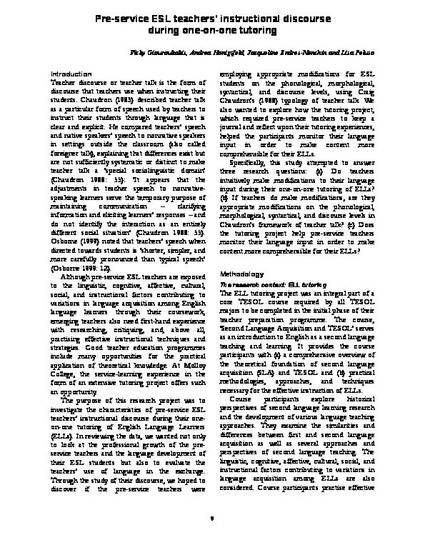 He compared teachers’ speech and native speakers’ speech to nonnative speakers in settings outside the classroom (also called foreigner talk), explaining that differences exist but are not sufficiently systematic or distinct to make teacher talk a ‘special sociolinguistic domain’ (Chaudron 1988: 55): ‘It appears that the adjustments in teacher speech to nonnativespeaking learners serve the temporary purpose of maintaining communication – clarifying information and eliciting learners’ responses – and do not identify the interaction as an entirely different social situation’ (Chaudron 1988: 55). Osborne (1999) noted that teachers’ speech when directed towards students is ‘shorter, simpler, and more carefully pronounced than typical speech’ (Osborne 1999: 12). Although pre-service ESL teachers are exposed to the linguistic, cognitive, affective, cultural, social, and instructional factors contributing to variations in language acquisition among English language learners through their coursework, emerging teachers also need first-hand experience with researching, critiquing, and, above all, practising effective instructional techniques and strategies. Good teacher education programmes include many opportunities for the practical application of theoretical knowledge. At Molloy College, the service-learning experience in the form of an extensive tutoring project offers such an opportunity. The purpose of this research project was to investigate the characteristics of pre-service ESL teachers’ instructional discourse during their oneon-one tutoring of English Language Learners (ELLs). In reviewing the data, we wanted not only to look at the professional growth of the preservice teachers and the language development of their ESL students but also to evaluate the teachers’ use of language in the exchange. Through the study of their discourse, we hoped to discover if the pre-service teachers were employing appropriate modifications for ESL students on the phonological, morphological, syntactical, and discourse levels, using Craig Chaudron’s (1988) typology of teacher talk. We also wanted to explore how the tutoring project, which required pre-service teachers to keep a journal and reflect upon their tutoring experiences, helped the participants monitor their language input in order to make content more comprehensible for their ELLs. Specifically, this study attempted to answer three research questions: (a) Do teachers intuitively make modifications to their language input during their one-on-one tutoring of ELLs? (b) If teachers do make modifications, are they appropriate modifications on the phonological, morphological, syntactical, and discourse levels in Chaudron’s framework of teacher talk? (c) Does the tutoring project help pre-service teachers monitor their language input in order to make content more comprehensible for their ELLs?